A file monitor can only be created for a single file, but you may have as many file monitors in Retrace as you desire. Directory & multiple file monitoring isn't currently supported. 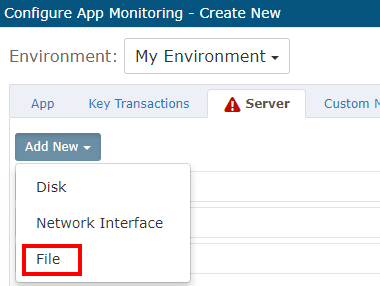 The File Check option is in the Server tab of the Monitoring Configuration widget. You can setup a File Check Monitor as an App Monitor or as part of Server Monitoring Template. To add a new File to be monitored click Add New > File . You are able to configure the alert threshold here like any other type of monitor. You can use the drop down boxes to select the severity threshold of the Monitor. Like all monitor types that are available in both Server Templates as well as App Dashboard configuration, the main difference is file monitors that are configured on a server will only be applied to servers that have the appropriate Server Monitoring Template applied, whereas in the case of an App Dashboard configuration the file monitor will be applied on every device that the application is installed.